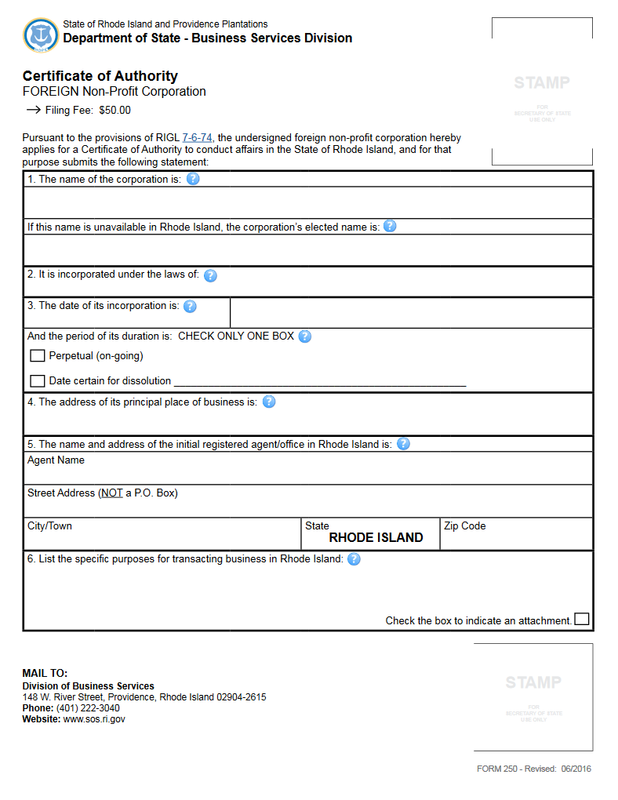 The Filing Fee for the Rhode Island Certificate of Authority – Foreign Nonprofit Corporation | Form 250 is $50.00. This payment must be received by the Rhode Island Secretary of State Business Services Division in order for this application to be accepted. If you are filing in person, you may submit this payment in cash, with a check, or with a credit card but submittals filed by mail may only be paid for with a check. All checks must be made payable to Rhode Island Secretary of State. Step 1 - Download the appropriate forms from the above links. You must select the “Download Application for Certificate of Authority” link or click here: Form 250. Download the Fictitious Business Name Statement only if the filing entity cannot legally use its Name in the State of Rhode Island. Step 3 - In Item 2, you will need to report where the foreign entity is incorporated. That is, the state of jurisdiction. Step 4 - In Item 3, report the Date of Incorporation for this entity as it is listed in its parent state’s record books. Step 5 - Item 4 will require the Full Address of the Principal Office of the foreign corporation to be listed in the space provided. Step 6 - You must report the Full Address of the Registered Office as well as the Registered Agent there who has agreed to receive service of process documents on behalf of the foreign corporation in the event it must appear in court. In the first box of Item 5, report the Registered Agent’s Full Name. Then use the boxes in the next two lines to fill in the Physical Street Address, City, and Zip Code where the Registered Office is located. 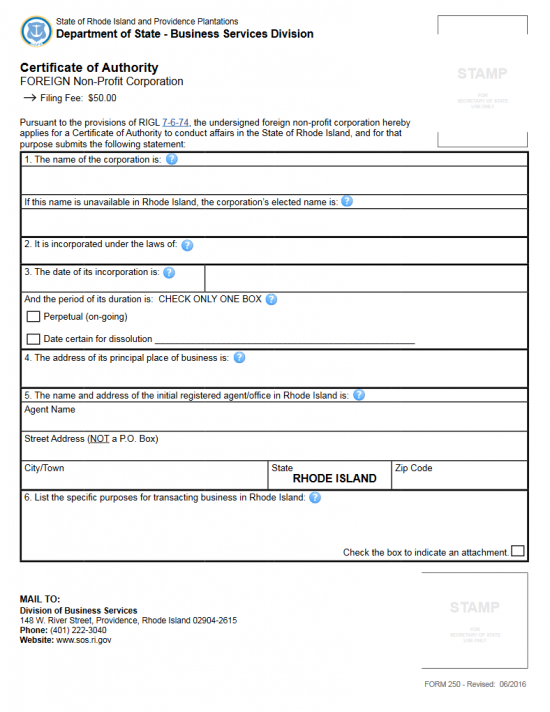 Step 7 - Enter a description defining the Purpose of operating in the State of Rhode Island in Item 6. If there is not enough room place a mark in the box labeled “Check the box to indicate an attachment,” then continue defining the Purpose on a separate sheet of paper that is clearly labeled. Step 9 - Item 8 requires you attach a Certified Copy of the foreign corporation’s Articles of Incorporation from its parent state along with all amendments. This must bear a Date that is within sixty days of the Filing Date. Step 10 - Beneath the verification statement, at the end of this document, the President or Vice President must Type or Print his or her Name and indicate if he or she is the President or Vice President by checking the appropriate box. Next to this, the Date of Signature will need to be entered. Finally, the President or Vice President must Sign his or her Name below the box that calls for this party’s printed Name. 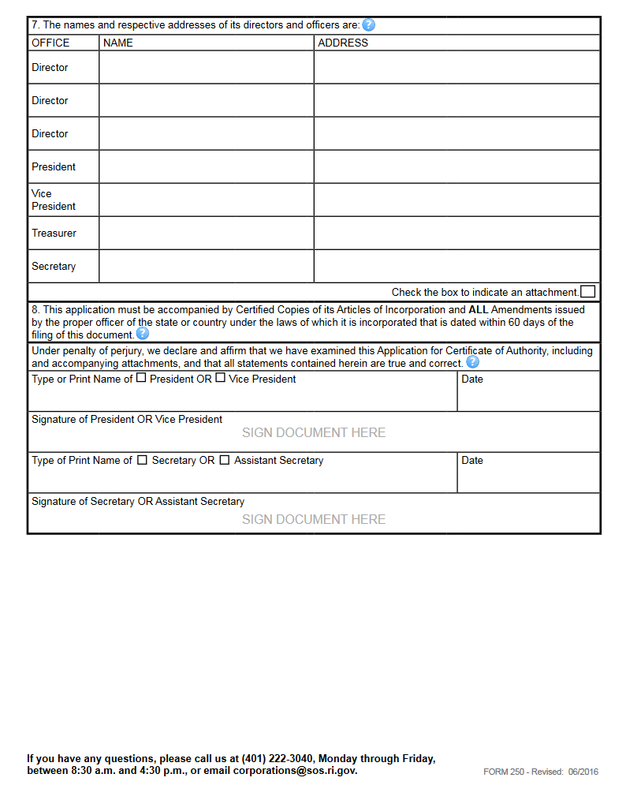 Step 11 - Next, locate the box “Type or Print Name of Secretary or Assistant Secretary.” Here both the Secretary and Assistant Secretary will have a check mark. In the space provided this party must sing or print his or her Name and check the box indicating his/her Title. To the right of this, the Date of Signature must be provided while below this line the party reported must Sign his or her Name in the space provided. 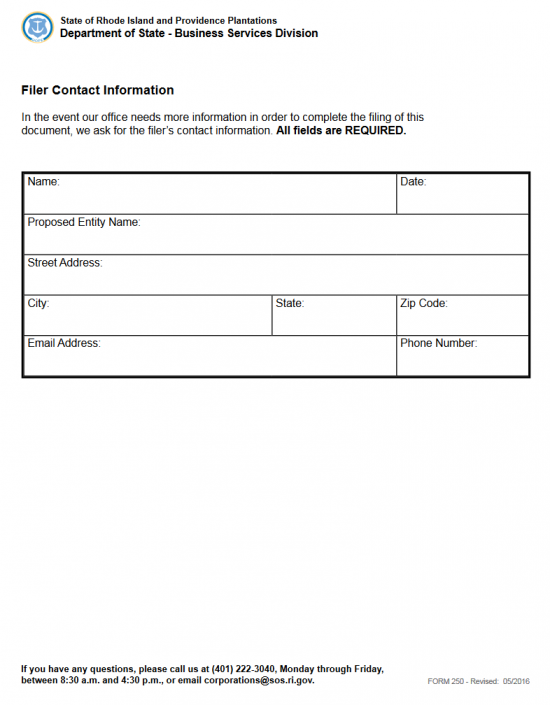 Step 12 - The accompanying Filer Contact Information page must be filled out in case the Rhode Island Secretary of State Division of Business Services requires clarification or additional information regarding these articles. This will require a Contact Person who may act as a correspondent with the Rhode Island Secretary of State to resolve any issues that may arise. 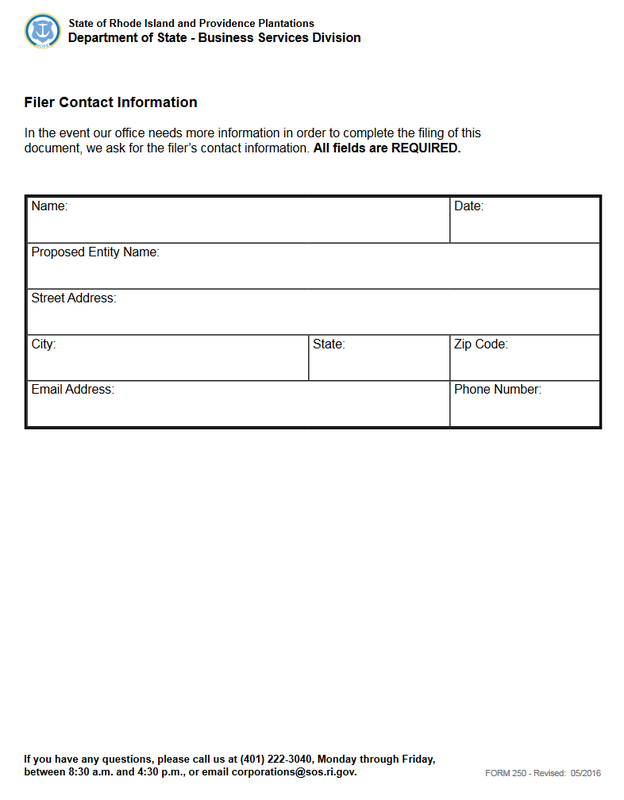 On this page, enter the Full Name of the Contact Person, the Current Date, the Proposed Business Name, the Contact Person’s Full Address, the Contact Person’s Email Address, and the Contact Person’s phone number.